Transformers get their name from the kind of work they do-they TRANSFORM ELECTRICAL POWER. 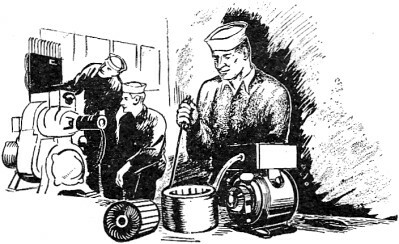 Suppose you had to supply a galley stove at 220 volts, the ship's lighting system at 110 volts, and a 6-volt signal-bell system. Three different generators for three different voltages? Absolutely not! Use transformers, and then one generator can supply all three loads-each at its proper voltage. Your generator would have a standard output, say 110 volts. One transformer would STEP this UP to 220 volts. Another would STEP it DOWN to 6 volts. This sounds like something for nothing-but it isn't. TRANSFORMERS DO NOT INCREASE OR DE-CREASE POWER. Remember that power is voltage multiplied by current. And when a transformer changes voltage it also changes current. If you INCREASE the voltage, the current is DECREASED. One goes up and the other goes down power INPUT. The VOLTAGE and CURRENT of a circuit ARE CHANGED BY TRANSFORMERS. But the TOTAL POWER remains the SAME. 1. There is an iron core. 2. There are TWO electrical circuits. 3. Energy is transformed from one circuit to the other by a field of flux. Look at figure 218. This is a SIMPLE transformer. Modern transformers are not built this way, but every important transformer principle can be illustrated by this diagram. Figure 218. - Simple transformer. Figure 219. - Transformer flux. 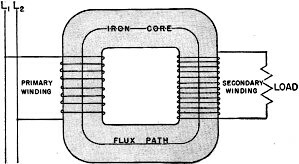 FIRST, notice the core - it forms a closed iron path for flux. This is the path of energy transfer between the two circuits. 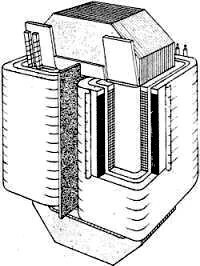 The efficiency of a transformer depends on this core and it is always designed to carry the maximum flux. SECOND, notice the two circuits - they are formed in coils around the iron of the core. The coil, or winding, that receives energy from the source is called the PRIMARY. In figure 218, the winding on the left is connected to the line, or source - it is the primary. The other winding, the one connected to the load, is called the SECONDARY. In the figure, the winding on the right supplies the load - it is the secondary. Never let the relative number of turns on the two windings confuse you. The source winding is always the primary and the load winding is always the secondary. If the load and source connections of figure 218 were exchanged-the names of the windings would also exchange. THIRD, notice the flux set up by the transformer primary. Figure 219 shows this better than figure 218. You know that this is a mutual induction circuit. And you know something else about it-you know that flux lines must be cut for transfer of energy. 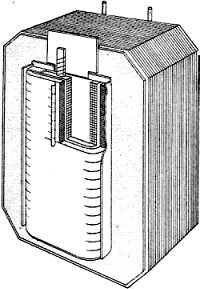 Neither the primary nor the secondary coils can move. So the flux field must move. And that means just one thing - ONLY A.C. and PULSATING D.C. can be used in transformers - they produce moving fields. Imagine that 60 cycle a.c. is being fed into the primary of figure 219. A field blossoms out around EVERY PRIMARY TURN. The iron preserves this field and carries it to the secondary. At the secondary EVERY TURN is cut by the field. Voltage is induced in the secondary and power has 'been transferred from primary to secondary. In 60 cycle a.c., you know that current changes direction 120 times each second (two alternations to the cycle). Which means that the secondary is cut 120 times a second. Therefore, the frequency of the secondary is EXACTLY the same as the frequency of the primary. The question, "How much?" always comes up. That's because you are using transformers to change voltage. And what's the sense of using a device unless you know what you're going to get out of it? Figure 220 is a typical transformer setup. Notice the voltmeter readings. They tell the story of transformer voltage. The voltage of the primary (Ep) is 110 volts. The voltage of the secondary (Es) is 220 volts. You'll notice that the secondary is unloaded - an open circuit. Therefore, the secondary current is zero. But, how much current is there in the primary? Looking at the circuit, you see that the primary is connected directly across a 110 volt line. You'd expect a heavy current. But you're wrong - the voltage of self-induction (Esi) in the primary is very high. The tight windings and the iron core cause every turn of the winding to be cut by almost the total of the coil's flux. The result is that Esi is almost equal to Ep. Not only equal - but OPPOSITE. And this nearly equal and opposite Esi chokes the current down to an extremely small value. The small current that does flow is called the MAGNETIZING CURRENT of a transformer. Figure 220. - Step-up transformer. The magnetizing current is only one-tenth of an ampere. Notice that Esi was subtracted from Ep. Remember that Ep and Esi are OPPOSITE - they cancel each other, so one must be subtracted from the other to get THE NET VOLTAGE ACTING ON THE CURRENT. It's like the counter-emf in a d-c motor. Now to get back to the why and wherefore of that 220 volts on the secondary. It's like this - the magnetizing current's flux produced 109 volts of self-induction on the 11 turns of the primary. That's just slightly under 10 volts per turn. Call it an even 10 volts. Is there any reason why this flux is not producing a like voltage - 10 volts per turn - on the secondary winding? No reason in the world - both coils are on the same core, so whatever flux cuts - one, cuts the other. BUT - and it's a big "but" - the secondary has 22 turns. And at 10 volts per turn - that's 220 volts. Ts = turns in secondary coil. Suppose a transformer has 600 volts and 2,400 turns on the primary. What will be the voltage of a 400 turn secondary? 600/Es = 2,400/400 = 100 volts. Here's another way to work this problem. How many volts per turn in the primary? 600 volts divided by 2,400 turns - 1/4 volt per turn. The volts per turn of the primary and secondary are just about equal, so 400 turns multiplied by 1/4 volt is 100 volts on the secondary. Notice that this transformer is a step-down job. The voltage goes from 600 volts to 100 volts. Transformers are highly efficient. As high as 98 percent. That's why you can ignore the difference between Ep and Esi in calculating volts per turn. 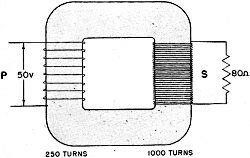 Is = Es/Rs = 220/44 = 5 amps. Right here is a good place for you to get this fact straight. THE SECONDARY CURRENT IS CONTROLLED BY THE LOAD. If the load had been 22 ohms instead of 44 ohms, the current would have been 10 amperes instead of 5 amperes. Figure 221. - Loaded transformer. The 5 ampere secondary current is OPPOSITE in direction to the primary current. You can prove this by the coil hand rule. Or - reason it out this way - the current in the secondary is produced by the voltage induced by the primary field. You know that Esi is opposite to Ep and you know that both Es and Esi are produced by the same primary field. Therefore, Es must be opposite to Ep. This is the same general rule you got for mutual induction circuits. Which says that, the currents in the two windings are INVERSELY proportional to their number of turns. and Ip = 10 amps. Which means that the primary current increases to 10 amperes for a secondary load of 5 amperes. Suppose another transformer has a primary of 70 turns, a secondary of 350 turns, and a 30 ampere load. What is the primary current? and Ip = 150 amps. You can prove this is correct by using the fact that primary and secondary fields are of equal strength. This brings you to an important fact about transformers. The load current in the SECONDARY controls the current in the PRIMARY. This control is centered in the action of the secondary flux. Every change of secondary flux changes the Esi on the primary and consequently the primary current. It is an automatic control. No load on the secondary reduces primary current almost to zero (only magnetizing current flows). As the secondary is loaded, its current. increases and the primary current increases with it. Figure 222. - Power in a transformer. Let's check this against an example. Figure 222 is a good practical problem. And these are the things you can solve for - Es, Is, Iv, Ps, and Pv. Is = Es/Rs = 200/8 = 2.5 amps. Ps = 200 x 2.5 = 500 w.
Pp = 50 x 10 = 500 w.
Note that Pp = Ps. A summation of the preceding information gives you three important equations and two important facts. 1. The voltage of the secondary is always opposite in direction to the voltage of the primary. 2. The current drawn by the primary is controlled by the secondary load current. Perhaps you are wondering why transformers are so efficient. The reason is their lack of moving parts. When moving parts are eliminated from a device, mechanical friction, the biggest source of loss, is gone. Losses become very small. Modern transformers are designed with just one idea - cut down the losses to as small a value as possible. In general, the losses that are unavoidable are divided into two classes - IRON losses and COPPER losses. Iron losses occur in the core. Part of these losses is due to the resistance of the molecular magnets. They must turn over every time the a.c. reverses. In a 60-cycle transformer, the molecules must shift around 120 times each second. Molecules resist this shifting; and their desire to stand still is called HYSTERESIS. You might say that hysteresis is really FRICTION. And you know that friction produces heat. The iron cores themselves act as wires. They are cut by the flux of their winding's fields, and carry small induced currents. 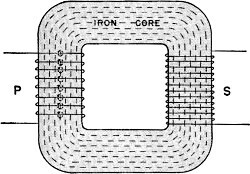 These induced currents are called EDDY CURRENTS because they flow entirely within the iron core. Eddy currents produce heat - they are really small short circuits within the core. Thus, IRON LOSSES are made up of two factors - HYSTERESIS and EDDY CURRENTS. Both produce heat , and both represent losses which must be subtracted from the output power. COPPER LOSSES occur within the windings. They are due to just one thing - the heat generated by the current in the winding conductors. Now here is an important fact - copper (and most other conductors) increases its resistance as it gets hotter. This means that if the heat resulting from iron and copper losses is allowed to accumulate, the windings will get hotter. And the hotter they get, the higher is their resistance. Which increases the power loss due to resistance. It's a vicious circle. Losses produce heat and heat produces even higher losses and so on. Figure 223. - Transformer cores. Hysteresis losses are reduced by using either a soft iron or a special transformer steel containing silicon. These metals allow their molecules to shift easily - with a minimum of friction. Eddy currents are broken up by constructing the cores out of thin plates of iron instead of a solid piece. This LAMINATED structure breaks up the eddy currents by insulating each plate from its neighbors. Eddy currents still exist - but they are so small that the loss they cause can be neglected. 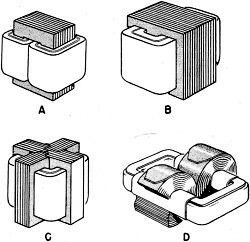 Figure 223 shows a number of transformer cores. Notice that they are all complete magnetic circuits, all are laminated, and all use iron generously. Reducing copper losses is a pipe. The windings are designed to be as short and as heavy as possible. Both short turns and large wire tend to decrease resistance and reduce heat. Finally, the overall loss in the windings, due to accumulated heat, is cut down by special cooling devices. Oil baths, radiators, and air blowers are all used to keep transformers cool. There are three general types of core design. Each has its own special advantage. But all put both primary and secondary windings on the same leg of iron. Figure 224A. - Core type. Figure 224B. - Shell type. Figure 224C. - Modified shell type. Figure 225. - Types of winding design. Figure 224 shows all three types. A - the CORE TYPE, is best for high voltage use. Its winding turns are short and IR drops are at a minimum. B - the SHELL type has longer turns because the middle leg is twice the size of the outside legs. The IR drops are larger but the flux path is shorter. Therefore, this type is best for heavy current loads. C - the MODIFIED SHELL type is a combination of both core and shell. The modified type has some of the advantages of both the simple types. There are two winding designs which can be used on ANY of the three types of cores. In figure 225, you'll see cross-sections of both types. A - the CYLINDRICAL design consists of a primary cylinder and a secondary cylinder. One is fitted over the top of the other. And then the whole winding assembly is slipped over the iron core. B - the PANCAKE design separates each winding into sections or pancakes. Then alternate pancakes of primary and secondary are slipped over the core. In the final assembly, all pancakes of the primary are connected together in series, and all pancakes of the secondary are. connected together in series. The cylindrical winding is a little cheaper to construct, but it is harder to repair. The pancake winding costs a little more but is easier to repair because it is broken up into sections. You'll run into both designs of winding and probably all three types of core. The best advice is to understand each, but leave them as is. Transformers are built to do just one job - change voltage and current values. They are designed to do it as efficiently as possible. Cores are laminated, winding turns are shortened, and artificial cooling is used. All these make the transformer the most trouble-free and efficient device used by electricians.